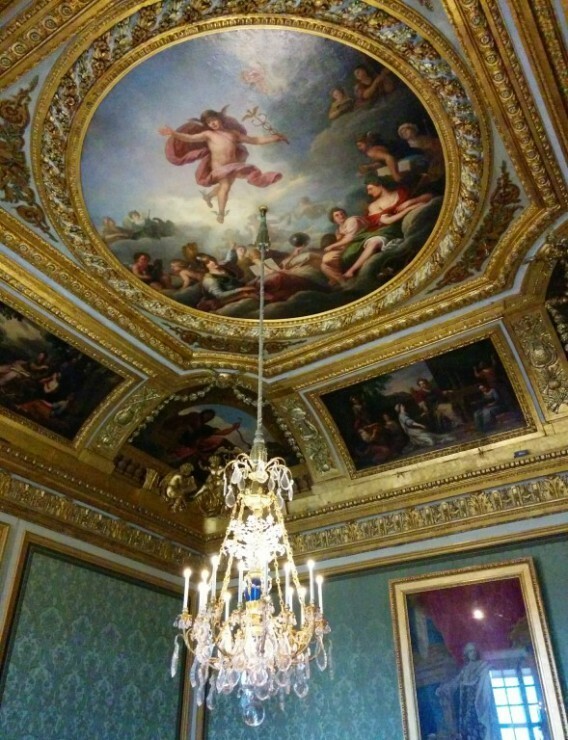 In case you missed my previous European posts, Evan and I started our trip in London, then traveled to Belgium and the Netherlands, Germany and Austria, Venice and Florence, Rome and Switzerland. 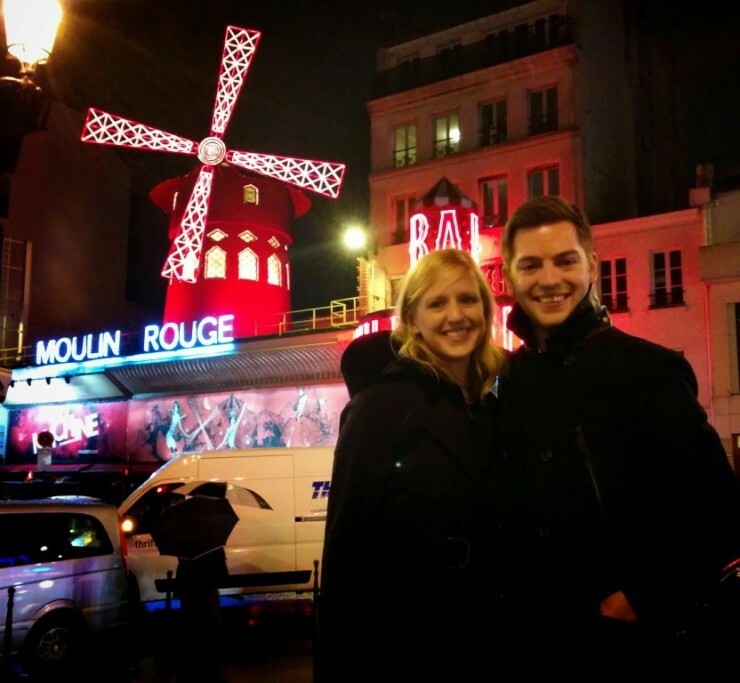 From Switzerland, we made the final stop of our two-week journey through Europe in Paris, France. The drive from Switzerland to Paris was long, and we didn’t arrive at our hotel in Paris until late afternoon. 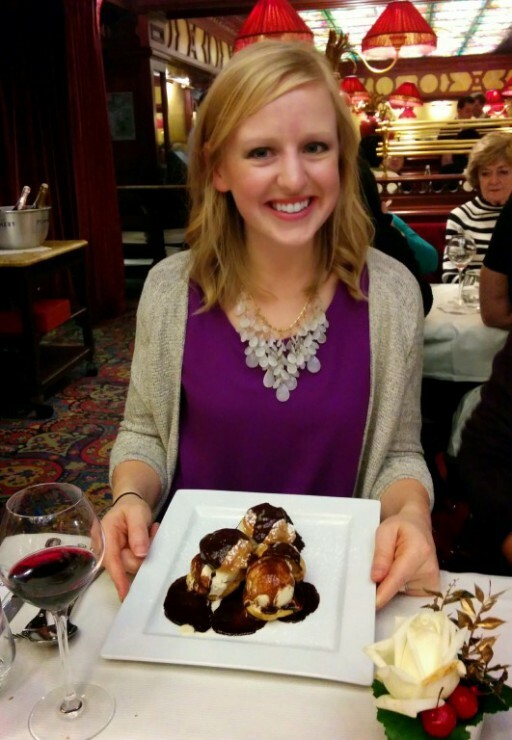 We had two nights to spend in Paris; the Moulin Rouge was scheduled for our final night, so our first night started with our Farewell Dinner. From our hotel, the Renaissance Hotel La Defense, we drove back into Paris, through the Arc de Triomph towards the restaurant. 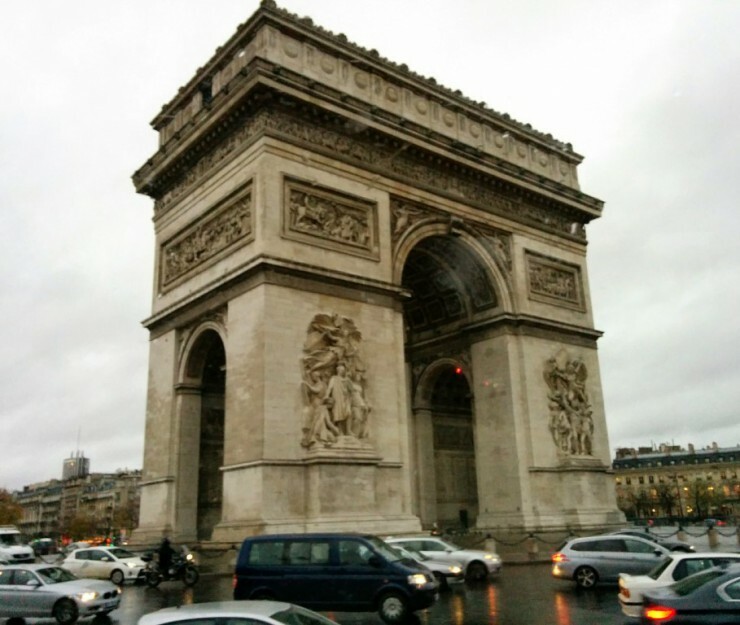 This was our first time through the Arc de Triomph; I wouldn’t recommend it on a coach bus, but I have so much respect for our bus driver for doing it multiple times. Just being a passenger stressed me out. I don’t remember the name of the restaurant, but we had several tables reserved for our large group. In order to make the process faster, we were given several meal options a few days prior, so when we arrived at the restaurant, they knew exactly what everyone ordered. 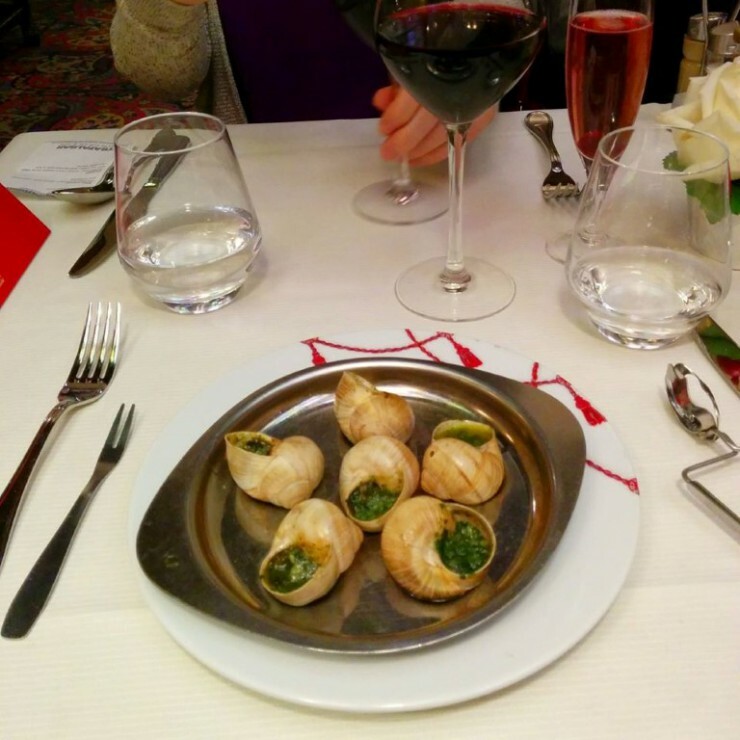 For an appetizer, Evan enjoyed escargot, and I was less adventurous and had French onion soup. 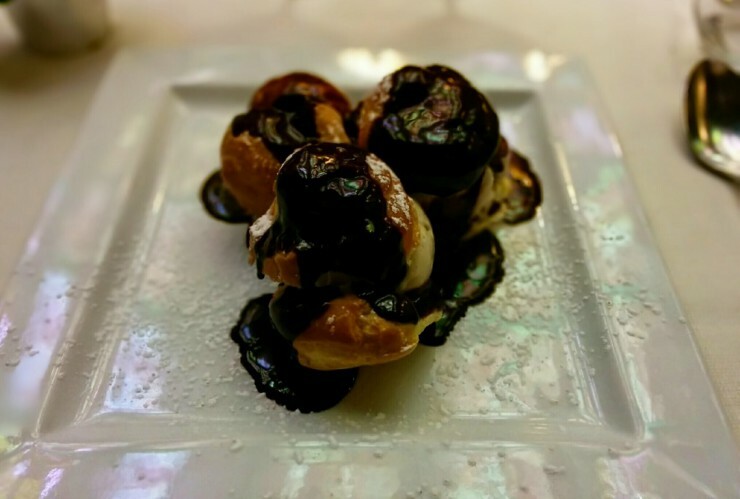 I can’t for the life of me remember what our main course was, but clearly the dessert was most important because I took numerous photos. 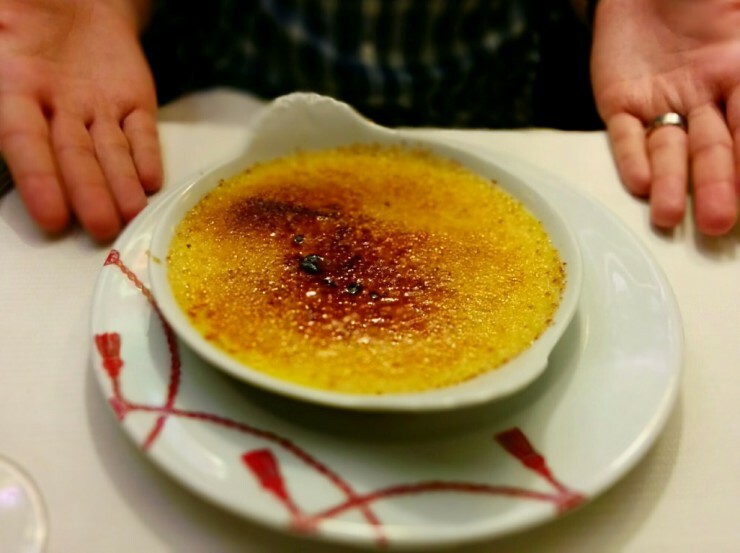 The crème brulee and crème puffs were delightful. 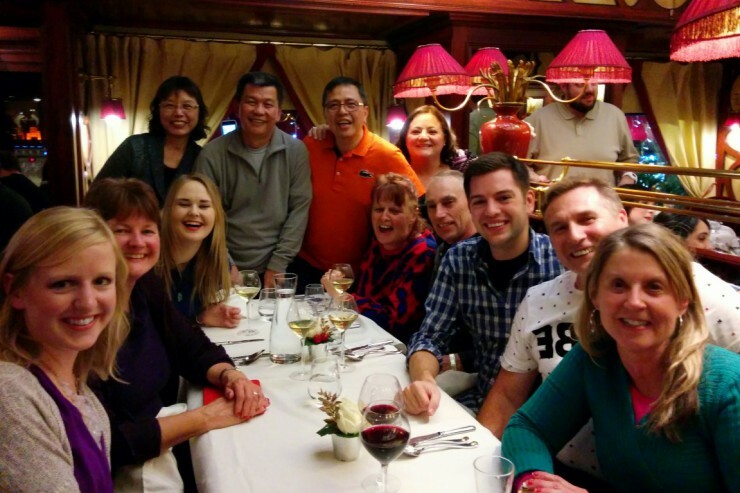 Everyone was having a good time and getting a little goofy; maybe it was because we’d all spent the last two weeks on a bus together, or maybe it was the wine, but a lot of little inside jokes from the trip turned into a lot of laughter. Everyone started taking silly photos and group pictures. 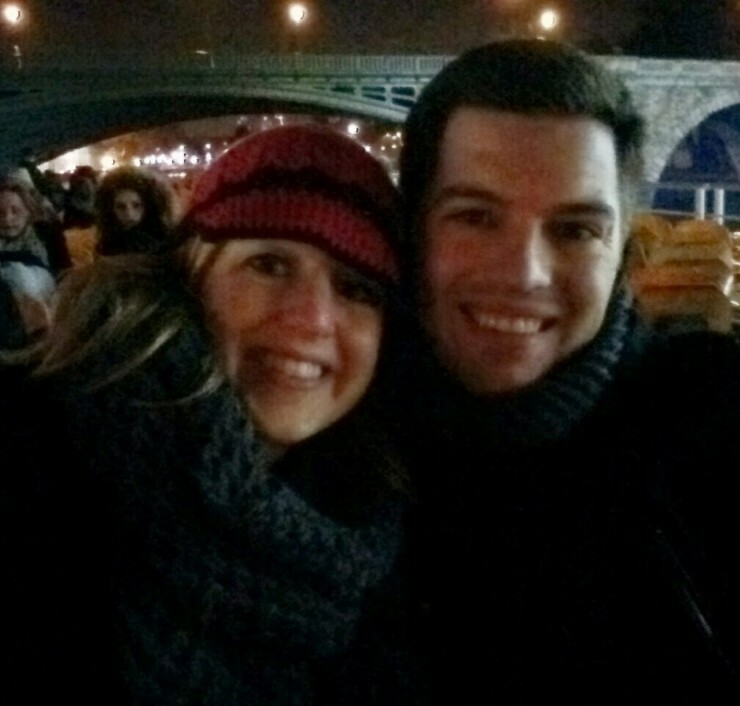 After dinner, our night continued with a boat cruise along the Seine. 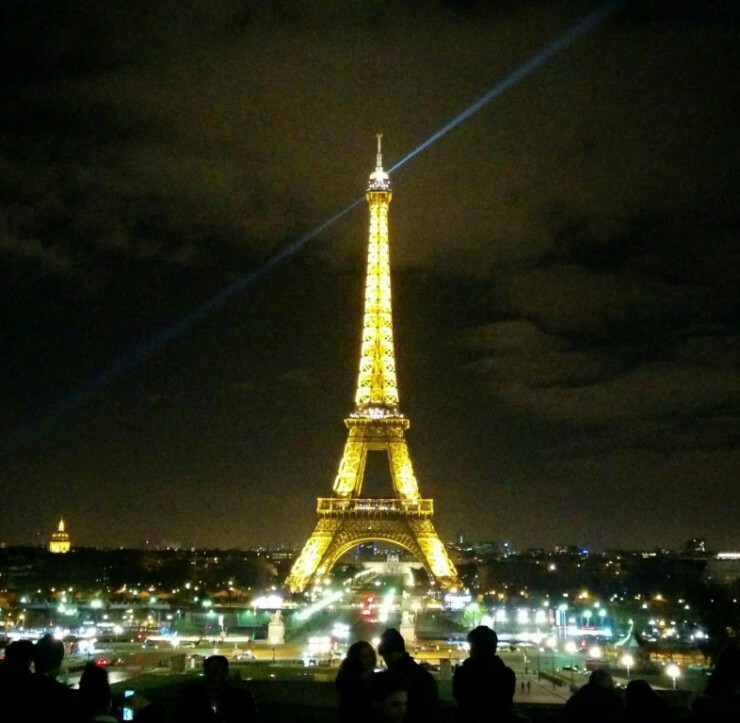 We experienced Paris by night and saw the Louvre, Notre Dame and the Eiffel Tower for the first time. 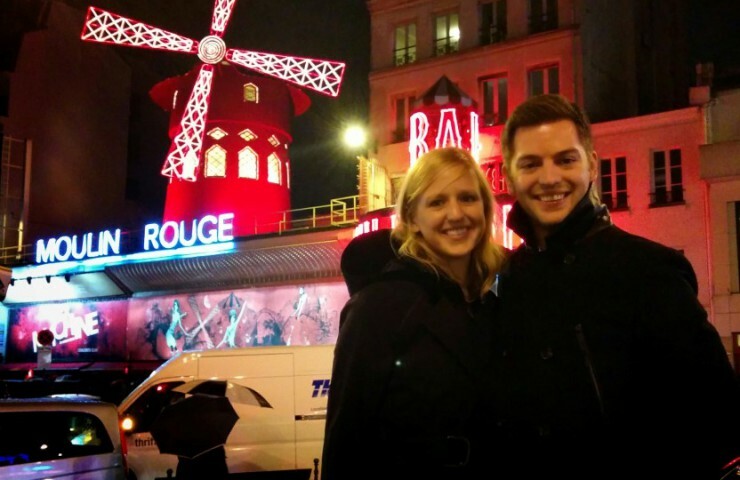 It was a great way to see the city and a perfect way to end our first night in Paris. 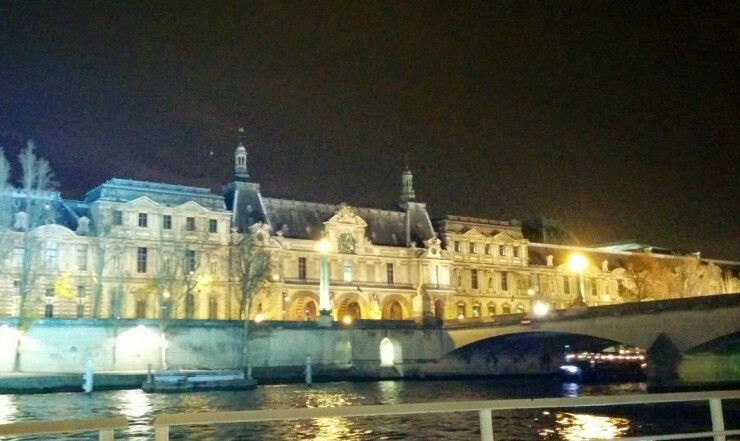 This was the only view of the Louvre we got on the trip. I would have loved to tour it, but it wasn’t part of our trip plan. I guess I’ll need to go back someday! 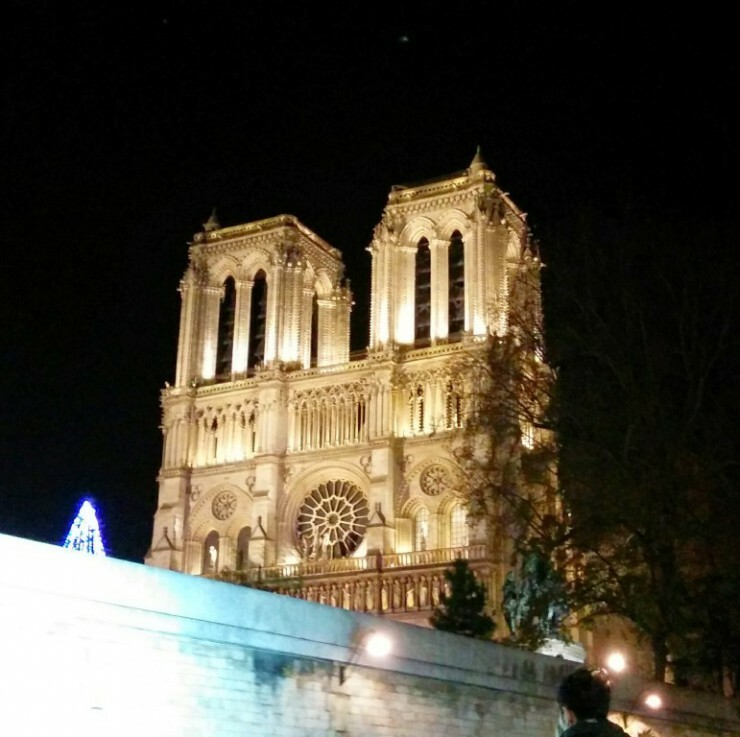 Similarly, we didn’t visit Notre Dame, but got to see it from the river cruise at night. 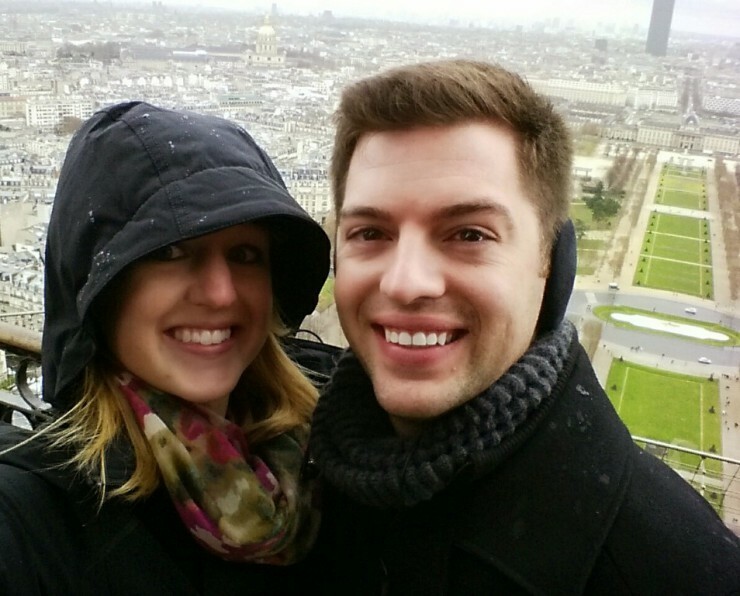 After our river cruise, we stopped at this lookout point to get an incredible view of the Eiffel Tower. It was beautiful at night! The next morning, we ventured back through the Arc de Triomph and got off the bus to do some exploring. 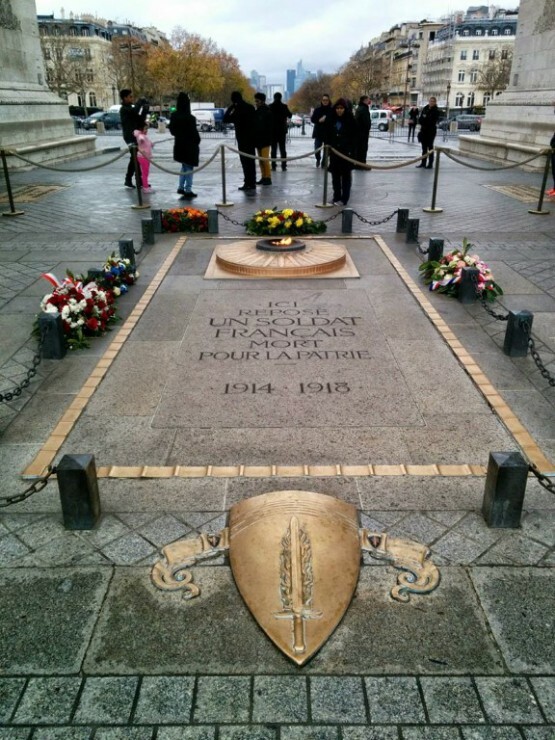 We walked underground to the center of the Arc de Triomph to see the Tomb of the Unknown Soldier memorial from World War I. We had some free time to wander down the Avenue des Champs-Elysees, where a lot of the luxury shops are located, but instead of shopping, Evan and I found a small café for a snack and coffee. I got a little too confident and tried ordering our cappuccinos in French. Turns out I was speaking Italian, not French, so I accidentally ordered three cappuccinos, instead of two. Whoops! 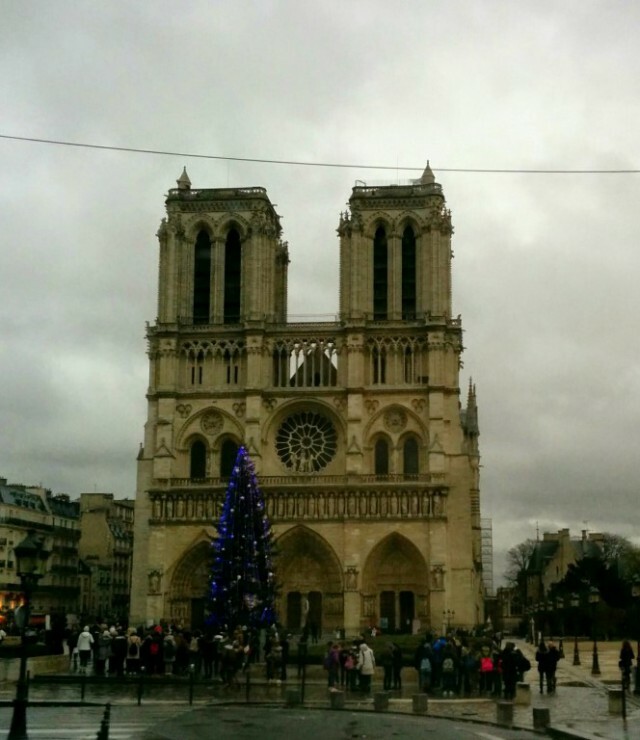 We met up with our group again and drove past Notre Dame on our way to the Eiffel Tower. 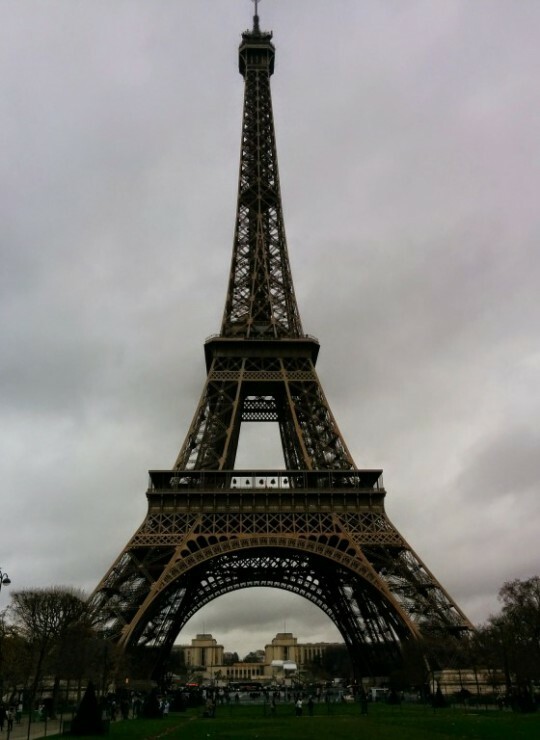 Once we arrived at the Eiffel Tower, Evan and I were going to be brave and walk up the stairs to the top, but it was really cold and windy, so we opted for the elevator instead. 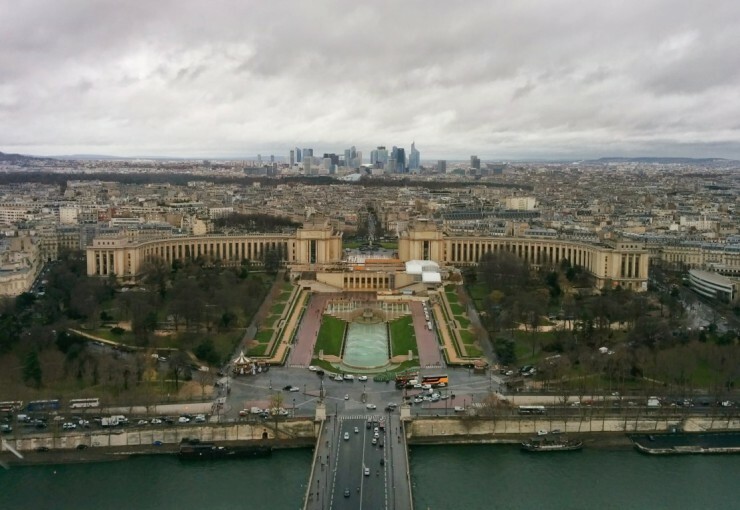 I’m really glad we went here because I feel like it’s a must-see when you’re in Paris, but neither of us wanted to spend much time outside due to the weather. 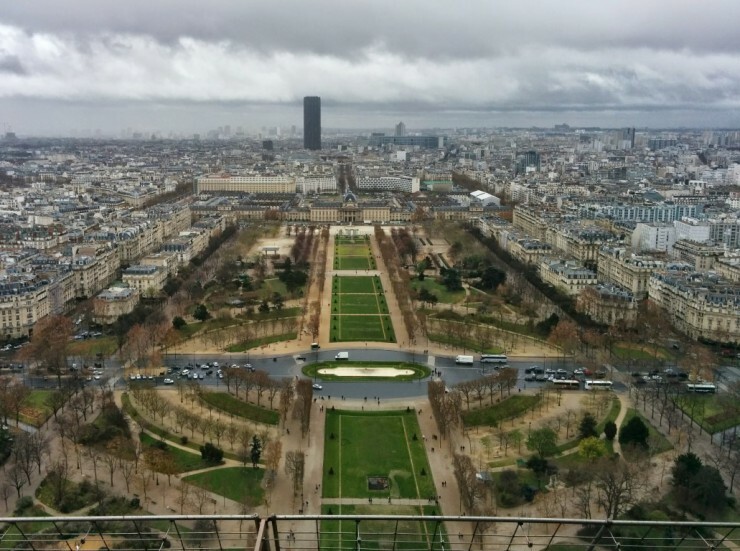 The views from the top of the Eiffel Tower were incredible. 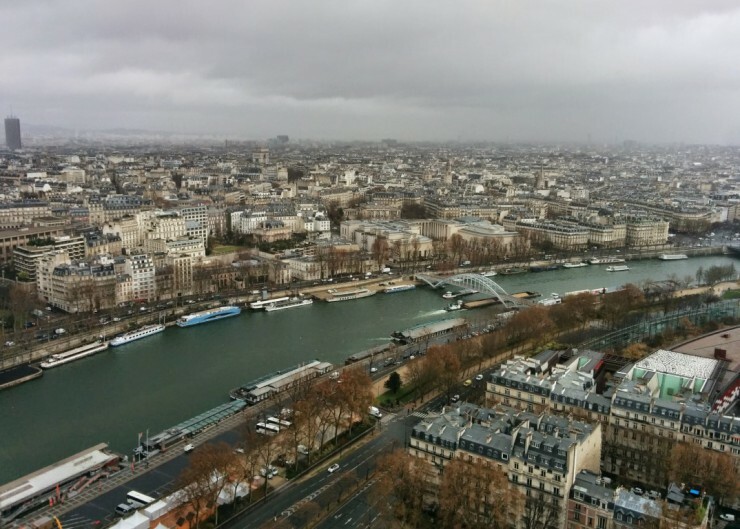 The best part about our visit here though, was eating a palmier from Laduree at the top of the Eiffel Tower. 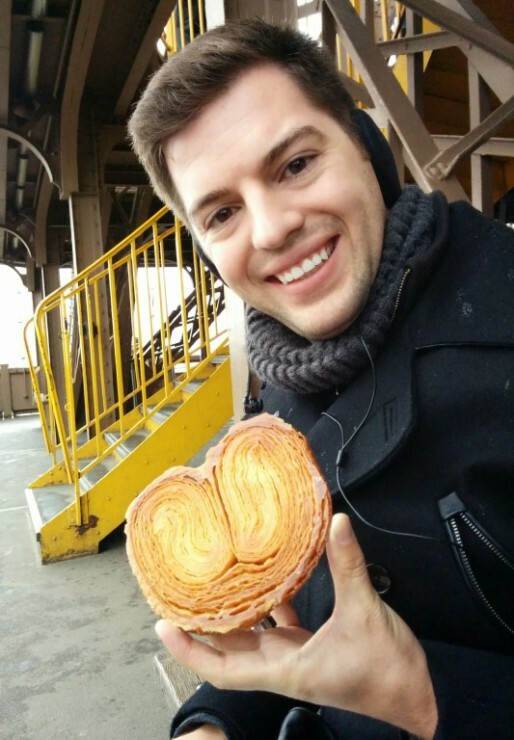 If you’re never tried a palmier, find a french inspired bakery near you and try one. The day before, we stopped at a rest stop along the motorway during our drive to Paris. Our tour director was raving about these pastries and told everyone to save him one at the counter. By the time we got to the counter, there was one left so we saved it for Emile. 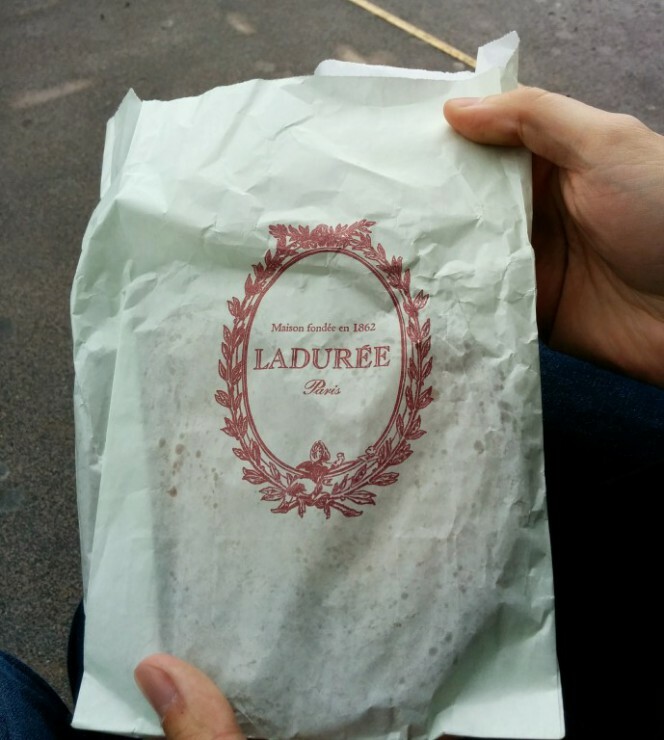 I think he felt bad we didn’t get to try one, because he bought us a palmier and gave it to us right before we got to the Eiffel Tower. 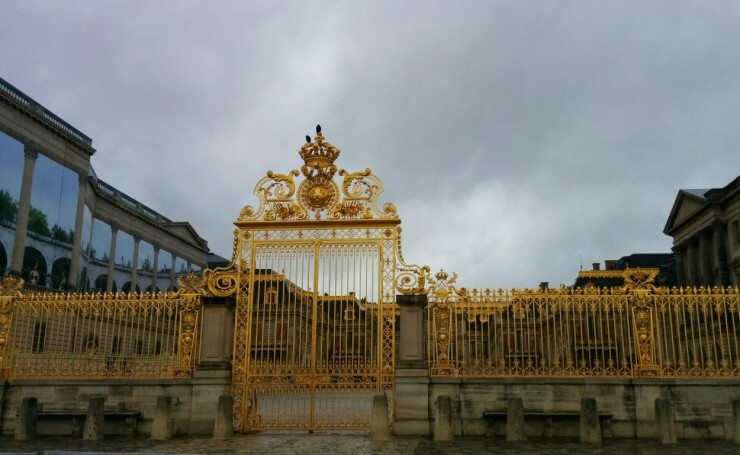 Our time at the Eiffel Tower was limited because we also planned a visit to the Palace of Versailles that afternoon. The drive out there took about an hour on the bus, but I’m glad we decided to participate in the excursion. 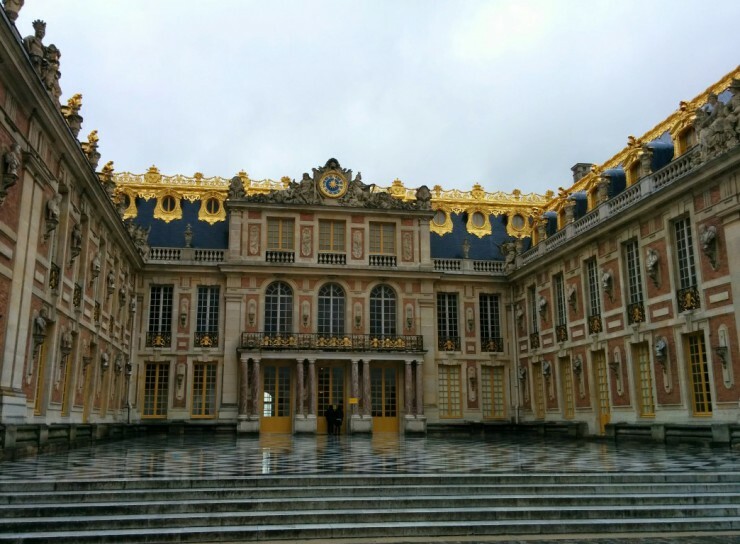 We went on a tour of the Palace and saw the private quarters of the King and Queen, incredible artwork and architecture, and the Hall of Mirrors. 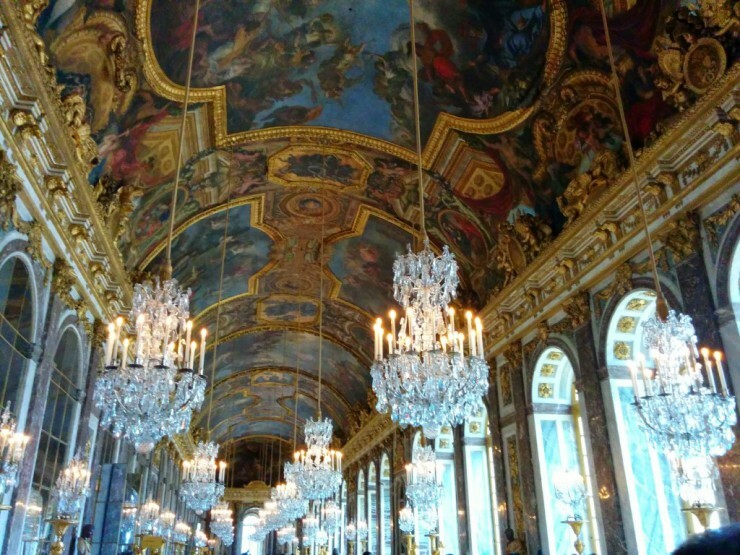 The Hall of Mirrors is the centerpiece of the palace. 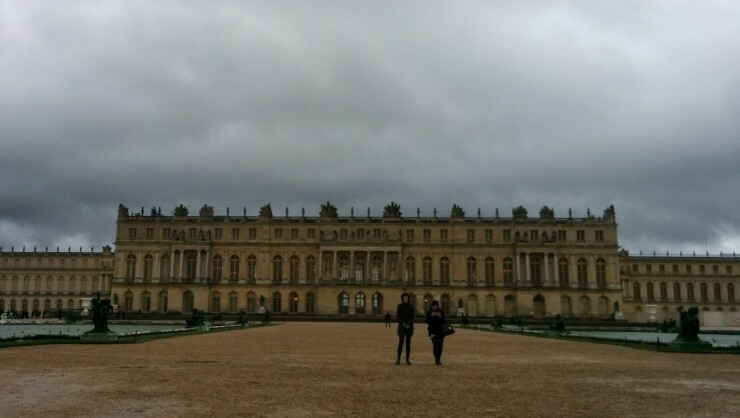 It served as a gathering place for functions and ceremonies of King Louis XIV and his successors. 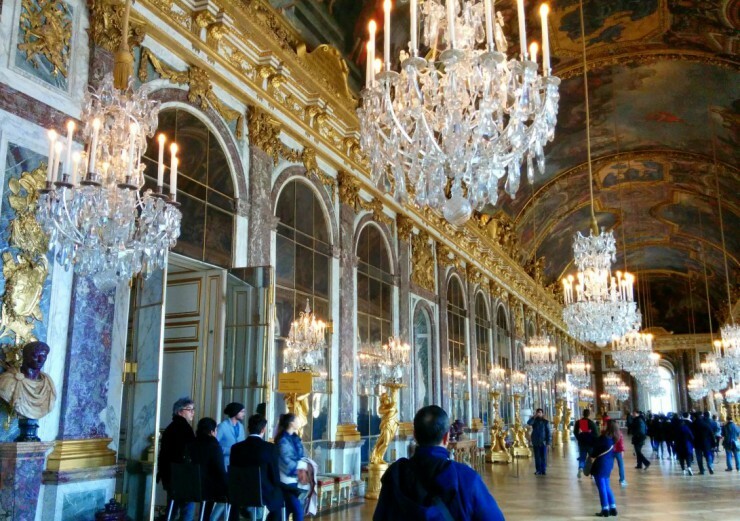 Most notably, in the 19th century, the Treaty of Versailles was signed in the Hall of Mirrors, symbolizing the end of World War I. 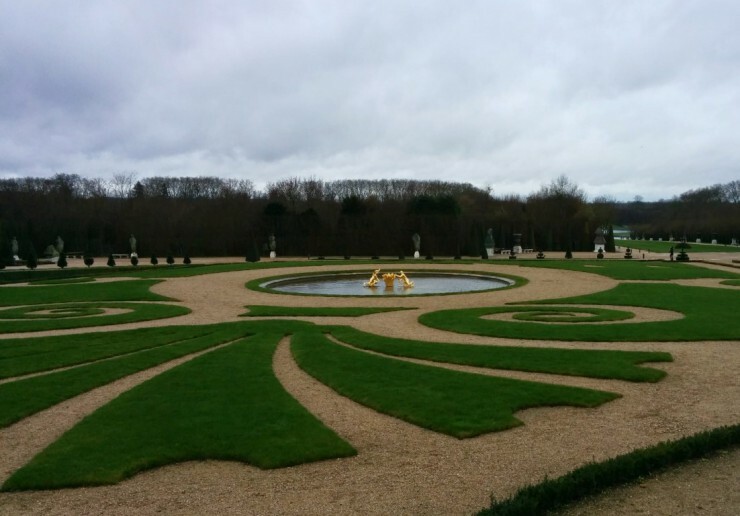 After walking through this incredible room, we wandered outside onto the property and saw the incredible gardens. It would have been even more beautiful in the summer on a warm, sunny day! 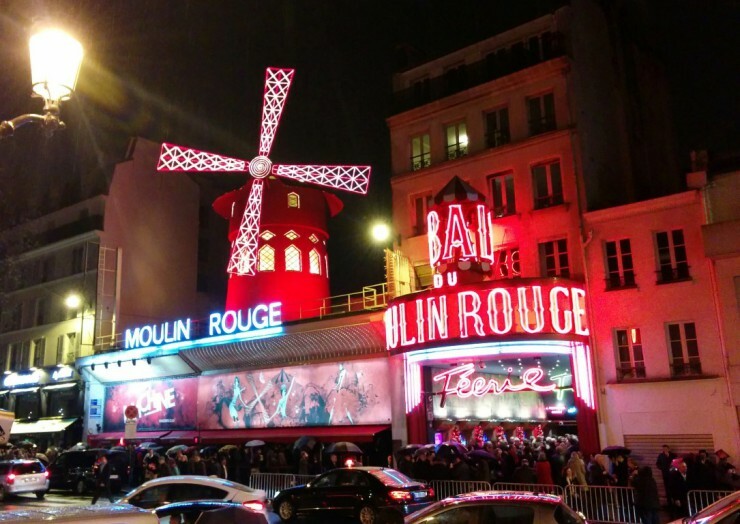 We left Versailles and headed back to the hotel briefly to change and meet up with the rest of our group for our last excursion of the trip: the Moulin Rouge! I was so incredibly excited for this. I never thought we’d get to see a show here. Our tour director lined up great seats on the main floor for all of us, very close to the stage. 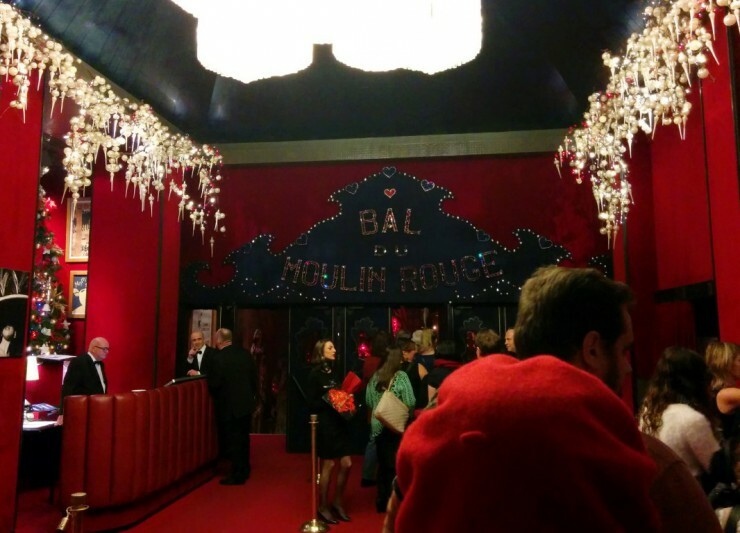 We enjoyed a three-course meal before the show began, then sat back and took in the unique flare of the Moulin Rouge. It was such a great show – a little more adult and more circus-like than I expected, but very entertaining and I loved seeing the can-can dancers! We weren’t allowed to take any photos inside, but we grabbed a few outside after the show. After the show, we headed back to the hotel and packed up our bags. The next morning, we had an early flight out of Charles de Gaulle back to Minneapolis. Although our vacation was coming to an end, I think we both were a bit excited to get home and prepare for our next big adventure (which was moving across the country to Seattle!). I’m so incredibly grateful for the opportunity we had to see so much of Europe in two short weeks; this trip was definitely one of the most memorable journeys Evan and I have embarked on together and I’d do it again in a heartbeat. Thanks for letting me share our adventure with you!